Sephrenia discovered that the Snowy Owls are up in Winterspring! EU for now, but that means NA servers should be seeing them spawn shortly. Latest comments on Wowhead are also indicating that the Snowy Owl is indeed available for capture now. But if in doubt, simply check out Winterspring on your server. It looks like "winter" will start November 1st, so good luck to everyone! The WowProgress Pet Battle ranking system received an update. Duplicates are no longer counted towards your pet score. This significantly changed the top ranked players (overall), and many went from over 14k pet score to 10k. While I'm still not a fan of a "pet score", I think this is the right step towards a more accurate and fair ranking system. PS: Thanks to Runestones on Twitter for the headsup! This is interesting news, and has both pros and cons. Pro: It will give everyone more of a chance to find and capture those heavily camped and hard to find wild pets. Not everyone can log on right after a server restart for a shot at a Minfernal lol. Con: Removes some of the predictability. Currently, it's basic knowledge that most pets will spawn in right after a restart or server maintenance. In 5.1, when pets are no longer guaranteed to spawn right after a restart, it will be more of a guessing game when they'll show up next. Pro: Makes it harder to camp those harder to find pets, giving more players a chance since it won't be as efficient to sit around and hoard the wild pets that spawn all at once. Con: Makes it harder to camp those harder to find pets, so rare quality hunting might be trickier. There are handful of other pluses and minuses, I'm sure, but right now the pros seem like they outweigh the cons. It's one thing to make a readily available in-game pet rare (hard to find), but it's another thing when only a select few even have a chance at it. With this spawning change in 5.1, hopefully we'll hear more success stories from pet collectors rather than tales of disappointment. Q: Will the new DMF Tamer and quest be available next week? Or after patch 5.1 is released? A blue confirmed that our awesome little buddy does have a very, very low chance to drop a mount and pet. It was also mentioned that his loot might be upgraded in a future patch. "You are perceptive. There is a very small non-zero chance for a mount or pet from the Blingtron 4000 Gift Package. We heard you like bling so your pal Blingtron may be getting some minor upgrades to their bling in an upcoming patch. The original Blizzard post detailing the Blingtron and its drops states that "it has a chance (a very, very small one) to give the gift of an Engineering mount or pet." It specifically names engineering pets, and since all of these profession companions are craftable, it looks like the Blingtron is just a secondary source. But! Who's to say what type or kind of pet will be added to its loot table in the future. It wouldn't make much sense to add misc pets other than engineering ones, but who knows if they'll be unique to Blingtron's loot table or also craftable. Personally, I would prefer if they were both craftable and a rare drop from him. That way if you're unlucky with crafting and/or purchasing the pet, you'll still have a chance at it once per day from Blingtron. Throughout my leveling and capturing endeavors, I've found some neat tricks for finding pets, specifically rares. One of these methods works well with wild companions that spawn in groups. There are some pets that have a high chance of spawning together with two to three others of the same or very similar type. They can usually be found wandering around in a pack. When you engage in battle with them, you'll almost always find the second and third pet are the same pet and quality for each one. Because they're essentially cloned teams, this can be somewhat frustrating when hunting for a certain one. The only way to generate new teams is to force a new spawn by removing the pets through defeating them in battle or killing them. But engaging in a Pet Battle with each one can be time consuming, and killing all of them doesn't guarantee a new spawn in the immediate area. Sometimes pets share the same spawn as other companions, so in killing one, you're taking a chance that the right one you're looking for will spawn in its place. It might not happen in the end. Instead of killing or defeating all of them, I've found a better way that utilizes these groups of pets. It doesn't always work, but it's pretty effective when it does. Instead of removing all of the companions in the group, I opt for removing most of them and leaving one behind. If there's one that stands out, I normally don't kill or battle that one. For example, in the image above, I would leave the large Tolai Hare alive, while defeating the other four. I've found that by leaving one behind, others will quickly respawn to join it, but with a differnt second and third pet on their team. By being able to identify the original pet of the group, I can avoid battling that one since I already know what the team make up for that companion will be. Instead, I can focus on the freshly generated pets that have new teams. If they repsawn quickly enough, I can just sit in one area for a while and hunt for a rare version of that pet within the respawning group. It removes the time required to find the pet, and any travel time to get from one to the next. Like I mentioned earlier though, this doesn't always work, and sometimes even if I leave one up, others won't respawn. Other times it might take some time for them to respawn, in which case it's more efficient to find another group or another pet to battle. But so far, this has worked about 90% of the time for me. It can take a while for a rare to actually pop up, though. Yet when compared to having to search for single spawned pets and trying to find a rare amongst them, the time used is comparable imo. UPDATE: WowProgress updated their ranking system to not count duplicate pets. Disclaimer: The following thoughts are my own and do not reflect the opinions of Warcraftpets or anyone else. To each their own. How ironic. MMO-Champion featured the Pet Score rankings on Wowprogress. I recently found out about this new feature too. My thoughts are less than shiny. The rankings on Wowprogress.com are based on the quality and level of pets that you own. Rare max level pets will obviously give you a higher ranking. You can view the list by overall or by realm. So what's not to like about this ranking system? Simple: It seems like it's really easy to game. It's not clear, but it appears as though the score only looks at quality and level, and not unique pets owned. Technically, you could just capture all rare Pandaria wild pets and gain ranks this way. It doesn't matter which pets, as long as they're rare and high level. You could fill your collection with duplicates and it would still count. If this is true, and this ranking system is so easy to cheese and exploit, I really can't say that I think very highly of it. It's not that hard to collect all rare Pandaria companions, especially if the same pet count more than once for your overall score. It would totally be possible to clear out your Pet Journal, save for a few max level rare quality pets, and then capture ONLY Pandaria companions. This would boost up your pet score significantly since you would only have rares and high level pets in your collection. Doesn't this seem a little ridiculous to anyone else but me? Are the rankings even accurate? MMO-Champion mentions that "top ranked players are nearing 20 rare level 25 pets!" but I know more than a few people not on that "top ranked" list that have over 20 level 25 rare quality companions. This just doesn't make sense to me. What exactly qualifies as an accurate pet score anyway? SHOULD duplicate rares count towards your total? Who's to determine this and why should they have the last say? Pet collections are mainly a personal affair, how can that be quantified for the general public? Another reason I'm not for these rankings is because this mini-game was meant to be noncompetitive. This was Blizzard's reasoning for making PVP Pet Battle anonymous, only showing how many battles you've won, and not having official win/lose rankings themselves. I'm pretty biased when it comes to this since I'm not competitive in the slightest. Yea, if I really don't care, then why mention this ranking system at all? My issue is how will it change the pet collecting community? What will happen to the reasoning behind collecting? Rather than collecting for fun and for personal pleasure, will this style of gameplay turn into a peeing contest? Another part of me is bothered by the fact that with these rankings, part of me is going to feel obligated to "hold my own". Pride is only a natural emotion for humans, and I'm not an exception. When someone comes up to me and asks why I'm not number one, it does affect me. Don't get me wrong, I don't collect companions to be "number one", but when others project their ideas of what collecting is or should be onto me, it's not always easy to ignore. Anyway, for those seeking a ranking system, enjoy. But remember that it's probably not entirely accurate since it's currently possible to cheese to raise your pet score. I guess what I'll take away from this is that people will always find a way to turn something innocent into a contest. Most people love rivalry, but I'm just not part of that group. Could a Pet Battle ranking system be viable? Yes. But it would have to be more refined than this, and remove the ability to game the system imo. A good solution would be to make the score only include the highest level and quality of each unique pet. Duplicates wouldn't count, but at the same time if you have more than one of a companion, your "best" one would count towards your score. I think this system would be fair and much more acceptable. In the end, collect for your own reasons, not the status quo or because of anyone else's idea of why you should collect. That's what I've always believed in, and this philosophy is what I'll continue to follow. There is a total of 12 confirmed new wild pets coming in 5.1. These new pets are currently available for capturing and battling on the PTR. I was able to find where all of them are located, except for the two new ones in Pandaria. For some reason, I didn't find any wild companions in Pandaria, new or old ones. The Crow which can be found on the Darkmoon Island also can't be previewed atm, since the faire is currently not in town on the PTR. Also, since the Pet Journal preview of the Infinite Whelpling was bugged when I was gathering screenshots of all the new pets, here's a better preview of this little guy. So what are the new UI features? I mentioned in a previous post that the number of collected pet will be listed on the tooltips, but at the time, caged pets weren't showing this number. This has been updated and now both non-caged and caged pets will show the collected number. Another quality of life improvement is the addition of pet levels by zone on the world map. Hovering over each area will show the level of wild pets found there. Zones that have higher level pets than your current pet team will show up in red, while more level appropriate areas will show up in green and yellow. Just think of it like the colors in the quest log. The Pet Battle combat UI is being improved for your convenience as well. Much like the addons that show pet quality color, the upgraded UI will show that information without the aid of any addons. Many addons will still have more functionality than just showing quality, though. So you might want to continue using some of them in 5.1. According to the latest datamined information from the 5.1 PTR, it turns out that Mr. Bigglesworth will not be a drop off of a raid boss. Instead, he will be the reward for completing the achievement to collect all the vanilla raid boss dropped companions. In addition to this, the achievement name has changed. Before it was Classic Raid Collector. Now it's called Raiding With Leashes. MMO-Champion also has some screenshots of the Red Panda Cub that was mentioned as the reward for completing the achievement Seek and Defeat (defeat 8 legendary pets). However, when searching for this achievement on Wowhead and MMO-Champion, it seems to have been either removed or renamed. We'll see if the Red Panda Cub is still an achievement reward or a pet from some other source. After checking out the PTR a bit more, I found another neat update. Pet items will show how many of that pet you've collected. If you're at the cap for a specific companion, the tooltip will show it in red. Unfortunately, this new tooltip only shows up on pet items. This means pets that have not been learned and then caged by a player. These pets can be found under the Companion Pets tab in the AH, while caged pets can be found under the Battle Pets tab. So if you're checking out the caged companions on the Auction House, be sure to double check your own collection before purchasing to make sure you're not already at the duplicate limit. Another new discovery I made on the 5.1 PTR is the Brawler's Guild. There's actually a pet that can be purchased from this new faction's quartermaster. I don't know how I missed it before, but here's the information now! The Brawler's Guild is described in the official PTR patch notes as "underground fighting rings" in Stormwind and Orgrimmar. And let me tell you, underground fighting ring literally means underground fighting ring! I haven't checked out Orgrimmar yet, but in Stormwind the new Brawler's Guild area is hidden away under the Deeprun Tram. There's a small tunnel and flight of stairs that will lead you down into the arena. That's where all the action is. It's also where the quartermaster resides. Quackenbush sells other Brawler's Guild items, but the big one is a new pet, Clock'em. There isn't a reputation requirement on the item, but you can't purchase it right off the bat. I believe you have to earn "ranks" with the Brawler's Guild by winning PVE challenges inside the ring. I haven't tried it out yet, but from what I saw, it's basically like an arena match except you're up against NPCs and other non-player mobs. It's a solo encounter, so you're on your own inside the ring! It's still early, so Clock'em doesn't have any rep or rank requirements listed yet. But I'm sure one will be added later on. For now, it's a safe bet that some time and engery will need to be spent fighting for your life in the ring to prove yourself worthy of Clock'em to the Brawler's Guild faction. The Pet Journal on the 5.1 PTR has the new capturable pets (mentioned in my previous post) as well as the new raid dropped companions. There are a lot of new pets coming in the next patch, but if you can't wait here's a preview! Also remember that this is the PTR so pets are still a work in progress, and some may change over the course of this testing period. Last but not least, pay no attention to the colored border around each pet's icon. The PTR Pet Journal is slightly buggy and will show all pets as the same quality. Wamo of Warcraftpets found some of these pets in the Pet Journal on the PTR, and you can check them out here. "A new item has been introduced that can be used to upgrade the quality of Battle Pets: Battle-stones. Pets over level 15 upgraded in this way can lose up to two levels in the process." "The Dragon Kite can now be used in Pet Battles." "Player versus Player Pet Battles now award more experience." UPDATE: Added the bosses and raids that each pet will come from (as previewed in the Pet Journal on the PTR). MMO-Champion has the latest from an upcoming PTR build. Two new achievements and 13 new pets! Classic Raid Collector - Collect all of the battle pets listed below. Pandaren Spirit Tamer - Complete the Pandaren Spirit Tamer quest. Mumper just confirmed that these new pets will be from vanilla raid bosses. They are set to be BoP drops, and from both 10 and 25 man raids. These pets will be from Molten Core, BWL, AQ40 and Naxxramas. The droprate is described as "not too bad". Vanilla raids should be readily accessible by everyone, even those that haven't participated in the recent raid content. Even if you haven't done Trial of the Crusader, Icecrown Citadel, Firelands, etc., the older raids such as Molten Core, BWL, AQ40, and Naxx should be fairly easy to solo and/or clear with a relatively small group. I've known about this for a while now, but decided not to write anything about it since I wasn't sure if this was intended or if it would be changed. However, I've seen a few situations where others were using it, and since it could potentially save someone from an irritating encounter, I thought that it's about time I shared. An unannounced change was made back in 2011, where stealthing with a companion out would also cloak your pet and hide it from other players' view. It would still be visible to you, but from everyone else's point of view, both you and your pet pretty much disappear. In MoP, this still works for both druid cat form and rogue stealth (I haven't tested Mage invisibility or Hunter camouflage). But add a new step to the equation: entering a Pet Battle, and you've got yourself a whole new product. There are some pets that I'm fond of and there are others that I'm downright proud of. Sometimes it's not for obvious reasons, though, such as it was a very low droprate or it took a grind to earn it. Achievement rewards, special promotion pets, etc., it's only natural to take pride in these. But the ones that mean the most to me have history and sentimental value. Originally, I was hoping that some of these pets would be color-changers so I wouldn't have to collect specific ones, but it turned out that they didn't have that special color switching quality. So I had to go out and find one of every color. But I wasn't satisfied with just unique color; they had to be rare quality too. I think that was the ultimate challenge. It's quite easy to go out and find a pet that has a certain skin, but to find a companion in that color AND specific quality? The RNG odds are definitely stacked against you. Not only do you have to first track that companion down, the color and quality that it spawns with is completely randomized. I had to make a list of which lizards I wanted in what color. Unfortunately, some of them only come in one or two skins, while others can come in more. Coordinating which color should go with which specific pet made it slightly easier figuring out priorities, but it was still a challenge to find those companions that matched my specifications. This meant a lot of time terrorizing Orgimmar's critter population in search of just the right Spiny Lizard. I went through so many of them that I lost count after the first hour. It was a good way to earn some easy experience for some of my lower level pets, though. Each one picture above is a unique pet, same model, different color. I was tempted to try and capture duplicates in different colors, but I needed to collect one of each unique companion, anyway. Got two birds with one stone for this one. I was finally able to log onto the PTR, but using old character copies. This means that I don't have access to any of the new pets, and my Pet Battling progress is back to square one. It wasn't a complete waste of time, though. I managed to preview the possible battle abilities for the new pets. Here they are, from lowest level spell to highest level (2, 4, 10, 15, 20, 25). Remember that this is the PTR, so all of this is subject to change. UPDATE: Mumper confirmed on Twitter that we will get one choice of elemental spirit from the main quest. After completing it, dailies will unlock for each spirit (air, earth, fire, water) and each Pandaren elemental spirit will have a chance to drop from its daily's bag. Mumper also mentions that the elemental spirit quest and dailies will only be available "after you finish the last quest on the main pet battle quest line." Thanks to a heads up from Goldacc, I've found a possible source for the Pandaren elemental spirit pets (Pandaren Air Spirit, Pandaren Earth Spirit, Pandaren Fire Spirit, Pandaren Water Spirit). Wowhead has them listed as a reward for a one time quest, Pandaren Spirit Tamer. There's a catch though: you can only choose one as a reward. But! Don't panic yet. It looks as though the quest becomes a daily after completing it, and rewards the Sack of Pet Supplies. My guess is that the sack has the chance to drop the remaining Pandaren elemental spirits that you weren't able to pick initially. Both quest and dailies are account-wide as well, so it's not as if we could hop onto alts, do the main quest again and choose a different elemental reward. Keep in mind that this is still all in the testing phase and things could change. Data from Wowhead could also be off or inaccurate. We'll have to wait and see how things actually go. I hope I'm not speaking too soon, but I think the Tamer dailies are fixed now. I've been able to do all the Pandaria Tamer dailies for two days in a row, and all of the Grand Master dailies on the other continents. And just one last note, in case anyone is wondering, only the Grand Master dailies and the Pandaria dailies reward the Sack of Pet Supplies. All the other Tamer dailies reward only gold, however all dailies will net you experience for your pet team. Just a small FYI since this was different on the beta, and all dailies used to reward the sack. A recent WarcraftPets forum topic sparked my interest. How is the percentage increase in a successful chance to trap a pet applied? Is is 20% of the total, or 20% of the previous attempt? I'm referring to the basic trap, but the formula would probably still apply to upgraded traps. After doing some searching on the Pet Battle forums, it appears that the general consensus is that the 20% is of the previous trap attempt. Whether or not the proper term to describe this is "additive" or "multiplicative", I have no idea. Math was never my strong point lol. So for example, rather than simply multiplying 20% by 5 attempts to reach a 100% guaranteed trap, the 20% would be taken from every attempt prior. Let's say the trap has a 10% chance to land, but you miss the first time. 20% of 10% would be 2%, which means your next attempt has a 12% chance to be successful. Unfortunately, you miss again. This time instead of taking 20% from 10% and simply adding it, you would take it from 12% (your previous attempt). 20% of 12% comes out to be 2.4%. Add that to 12% and your next trap should have a 14.4% chance of landing. This would continue on until you successfully trap a pet, you reach 100%, or if the pet heals itself and/or your pet dies. With the two latter situations, it's possible that the trap success rate resets. I'm no expert on formulas, WoW theorycrafting, or any of the above, but this does seem to make sense based on personal observation. If the trap success rate is a flat percentage increase, it would only take 5 tries. This is not always the case, though. If anyone has done further research or has some insight into how the traps work, feel free to share in the comments! I'd love to learn more about this. MMO-Champion datamined more companions from the latest 5.1 PTR patch. Pandaren elemental spirits! You may be wondering, 'There's fire, spirit, and earth, so where's water?' Well the Pandaren Water Spirit already exists, and only the PTR datamined finds are listed above. The water version was added in patch 5.0.4, but was never released. In the next major content patch, 5.1, a new system will be implemented into Pet Battles: Battle-Stones. There's some discussion about whether or not these are a good thing or a bad thing for Pet Battles. I'm leaning more towards "good" but there's always the other side of the coin to consider. So what exactly are Battle-Stones? These items are used to "upgrade" any pet to a higher quality. For example, a poor (grey) cat could be turned into a rare cat using these stones. There are different stones for each quality. - Polished Battle-Stone can upgrade a pet to uncommon (green) quality. - Flawless Battle-Stone can upgrade a pet to rare (blue) quality. - Perfect Battle-Stone can upgrade a pet to epic (purple) quality. Note: This specific stone will NOT be released with patch 5.1, and is set for a possible future update. In addition to different stones for different qualities, there are also family-specific Battle-Stones. So for example, there are Polished Elemental Battle-Stones and Flawless Elemental Battle-Stones. Each pet family has its own version of uncommon, rare, and epic stone. It seems like a pretty straight forward concept, right? Obtain a Battle-Stone, pick a pet to use it on and that pet will have better stats than it started out with. This sounds like a perk, right? What flaw could anyone find with this system? I finally managed to capture a Silithid Hatchling! I've been pretty unlucky with the sandstorms in Tanaris since MoP came out. I'm either too late during the storm or show up in Tanaris when there's no sandstorm. Luck was on my side last night, though. :) I was in Tanaris just as the sands kicked up. Needless to say I freaked out and made a beeline towards the closest silithid area. It's no rare, but I'm content with an uncommon for now. I'll definitely still be on the look out for a rare version, though. - Started at 10:30 PM (Kil'Jaeden server time), but due to CRZ the zone time was 12:30 AM. - Ended at 1 AM (Kil'Jaeden server time), zone time was 3 AM. - Total time was about two and a half hours. - I only saw the Silithid Hatchlings spawn at the beginning of the sandstorm. Once those initial spawns were gone, I never saw anymore. - Darkmoon Glowfly: Capturable wild pet from the Darkmoon Island. - Imperial Moth and Imperial Silkworm: Possible drops while doing the Imperial Silk transmute (Tailoring) in the Silken Fields, BoU. Additionally, game designer Jonathan LeCraft (aka @TheCrafticus) Tweeted an image showing a preview of the possible Tailoring drops. PLUS, Dave Maldonado (@Dave_Maldo), another game designer, also Tweeted a preview of the Darkmoon Eye! I feel so spoiled with all of these previews and teasers! I'm not used to having so much companion information readily available like this lol. Anyway, looks like at least one pet from the DMF will be purchasable. There's still time to earn tickets since the faire is still open, so get your dailies and quests turned in ASAP! Since I felt pretty accomplished after reaching yet another achievement milestone, I started browsing through my collection to admire some of the gorgeously colored pets. - Battle Pet Training is now correctly shared account wide to all characters. Taming the World has been reduced to 40 pet tamers from 45. The achievement should now properly reward to players that earned it before or after the hotfix. Taming achievements should now reward correctly. Many players reported the criteria completed but the achievement would not complete. Taming achievements rewarding correctly should also alleviate the problem with daily quests not activating correctly. The daily quests are unlocked based on the Taming achievements being completed. - Strong and Pristine traps should now correctly be rewarded to players from achievements. This fix should retroactively award the traps to players that already have the achievements. - Purchasable pets have been removed from the Eastern Kingdoms Safari achievement. - An issue with account daily quests not resetting has been fixed. - Note that many of the achievement fixes will show incorrect UI until patch 5.1.0. Rest assured that the data is correctly working though. - An issue with phased pets in the Vale of Eternal Blossoms has been fixed. A lot of these fixes were mentioned previously, and Blizzard attempted to hotfix some of them but those didn't quite take. Hopefully next week's maintenance will do the trick and these issues will be resolved. 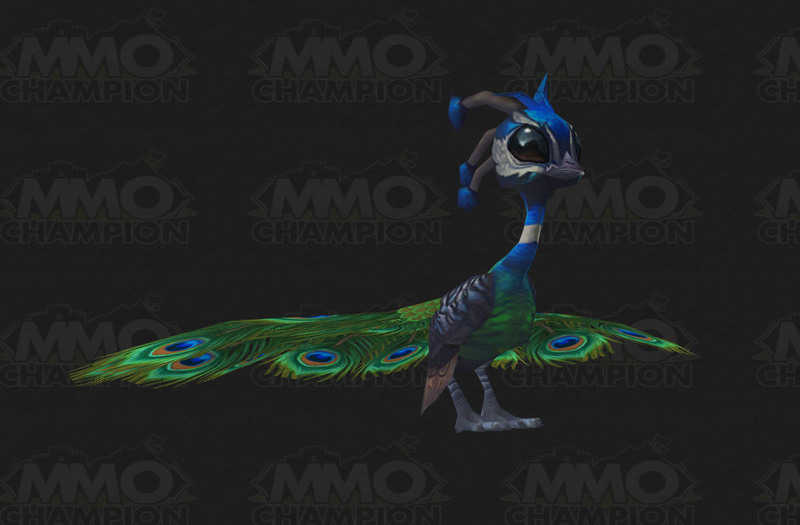 Three new Darkmoon Faire pets were datamined from the Patch 5.1 PTR. There was also a mention in the official patch notes. "Two new Battle Pets now roam Darkmoon Island waiting to be caught." Initially, I was worried that these new Darkmoon pets would be from another world raid boss, like the Darkmoon Rabbit. However, Mumper put those fears to rest when he confirmed in a Tweet that the Darkmoon Hatchling and Darkmoon Glowfly would be spawned pets, while the Darkmoon Eye would be from the new Darkmoon Tamer. UPDATE: MMO-Champion datamined the fire kitty pet. It's official name is Cinder Kitten. It's an epic quality item and is BoP. Here's a screenshot preview! Still no word on how it's obtained. All of these mentioned are Bind on Use, except for the Cinder Kitten. We'll probably find out where these pets come from in the near future. Disclaimer: Remember that this IS the PTR. Things could change and some features might not make it or be released as previewed into the final version of patch 5.1. The 5.1 PTR is out, and there are many new features for Pet Battles! Here are the official PTR patch notes, while MMO-Champion's datamined information can be found further down after the jump. The adorableness is overwhelming! 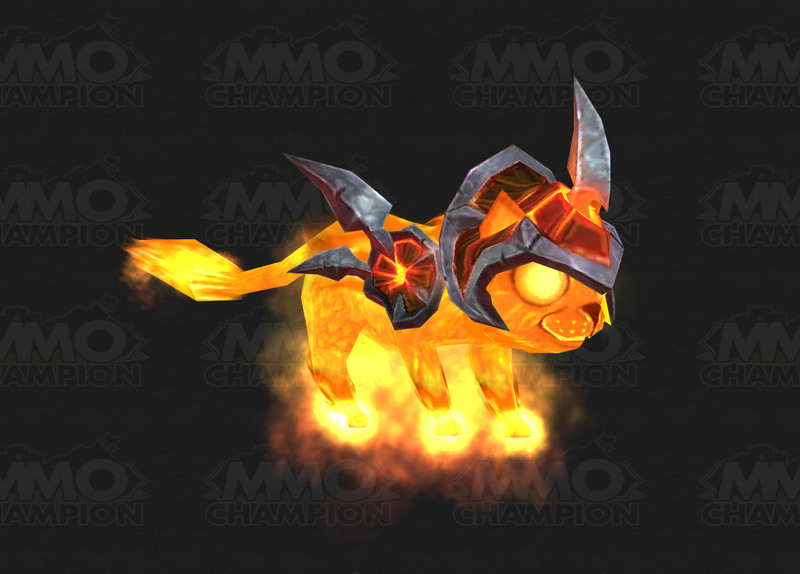 Blizzard's released a preview of a new upcoming pet, the Fire Kitten. Or at least that's what this bundle of fiery fluff has been nicknamed. There's no information on how it will be obtained yet, but I'm keeping my eyes and ears open. I absolutely do not want to miss any news about this one! He's just THAT cute. Part of me thinks it will be from the PetStore since the post mentions "adoption". We'll have to wait and see, though. Anyway, if you haven't seen the preview yet, you can find it here on WoW's official Facebook page. Wamo of WarcraftPets found what's likely the next TCG expansion deck and common pet loot card! According to dacardworld.com, the next TCG deck is called Timewalkers: Betrayal of the Guardian. Wowpedia is also listing this as the next release, although detailed information is still missing. Dacardworld has a release date of February 12, 2013, and mentioned a Floating Spellbook as one of the loot cards. Since the other loot cards are a mount and vanity item, the spellbook is probably the pet loot. This pet doesn't have a spell or item ID on Wowhead or MMO-Champion yet, but I'm sure after a patch or two, a datamined version will pop up. Another hotfix was deployed today to fix the achievement Taming the World. Prior to the hotfix, there weren't enough Tamers to battle to complete the achievement, and many players were stuck at 43 out of 45. Today's hotfix changed the requirement of the achievement to 40 total Tamers instead of 45, although the tooltip will not reflect this until patch 5.1. This should allow those that have NOT completed this achievement yet (under 40 Tamers defeated) to finish the achievement. Players that are above 40 Tamers defeated will need to wait for a future hotfix to finally be awarded the achievement. "For players that have yet to reach 40, the hotfix applied today should allow you to earn the achievement Taming the World when you do (instead of at 45). Blizzard is currently looking into the Pet Battle dailies not resetting and the strong trap not being awarded to eligible players. "If you're not seeing the daily quests for a continent, have you earned the Taming achievement to unlock them for that continent? Did they show up once and then never come back? (not resetting) Are any working at all, and if so, which ones? These wild pets have unique models, and are "one of a kind". They currently don't share the same look with any other companion, but there is always a chance that future pets might use the same model. I haven't run into too much problem in regards to PVP while out hunting for pets. Since the "old world" isn't as hip a place to be anymore, most of the zones are pretty void of people, which makes it easy to move around and battle in peace. The only time(s) that I've had a run in with horde is while I was battling in Pandaria. I managed to get away each time (just barely! ), but it put a damper on my Pet Battling experience. Thankfully, the exact same wild pet that I was fighting respawned (both had rares on their team lol). So it wasn't a complete downer. When I mentioned to guildmates that horde were poking at me at the most inconvenient times, though, they were pretty shocked that others could attack someone engaged in a Pet Battle. My guildies thought that you would be phased out, and were surprised to hear that the person in a Pet Battle just stands out in the open for all to see (and attack). I had to explain that yes, you aren't invulnerable, but you do get a shield that reduces incoming damage for a short period of time while you gather your bearings. This didn't seem to ease their disbelief, and as one guildie put it, "That's not player vs. player. That's like player vs. statue." That comment stuck with me. It really IS like someone hitting a statue and then that statue comes to life. Sure the person in the battle can sometimes see the other person coming, but what choices does the battler have to truly make it "player vs. player"? Forfeit the battle, lose the current pet team they were up against, just to fight off the enemy player? That doesn't seem like a very ideal choice to me. At least if the player stays in the Pet Battle and gets knocked out by an attack on them, the same exact wild pet will respawn. If they forfeit, the companion disappears. That being said, you pretty much are frozen in place until the first attack kicks you out of the battle. So a statue is a pretty accurate description. I don't fully agree with this, and I fail to see how this promotes healthy world PVP (more like world PVS, player vs. statue lol), but I have to admit that I can't see any way around it. Developers can't make you immune to player contact while in a Pet Battle because that would be too overpowered. It would allow a quick and cheesy escape from actual PVP. It can be frustrating to be up against someone of the opposite faction, but suddenly that person disappears or phases out. Making a Pet Battler phase out would be the same thing. It would be equally as irritating if you were immune to all damage upon entering a Pet Battle. Find yourself in a sticky situation? Get out of combat, find a wild pet, enter a Pet Battle, and bam! You're safe. Indefinitely. Kind of a cheap get-away, yea? So while I don't exactly like it, I do understand the need for this design model. It can be frustrating and discouraging if on the receiving end, but it seems to be the fairest compromise. The Brilliant Kaliri is one of the pets on my main team, and it is amazing when given the opportunity! I've mentioned it before but the ability Predatory Strike (unlocked at level 20) is awesome. It hits hard but on top of that it instantly kills the opponent if the opponent is below 25% health. So even if the pet survives with just a few health left, it will immediately drop dead as soon as the kaliri's strike attack is over. This is especially useful when battling tough Tamer teams. Instead of spending two or more rounds trying to whittle down their pets' health, once it's brought down low enough, the Brilliant Kaliri can take it out in one fell swoop. And let me tell you, it's not a pretty swoop either. You're not seeing things. I did not edit the text. Predatory Strike really CAN hit/crit for that much! Normally such a number would be OP and nerfed to the ground, but since this damage is only due to the "instant kill" portion of the Predatory Strike attack, it's really just superficial. Not to mention that no pet has 22,000 health at less than 25%. The big numbers just look cool and don't really affect gameplay or the battle. Even so, this pet is definitely one of my "go to" companions when it comes to battles! I'm still in the process of trying to figure out how the Tamer dailies work. From what I understand, after defeating a Grand Master, all the Tamers on that continent will offer you a daily once per day. So far, this hasn't been the case. Originally, the dailies were bugged and after completing them once, you couldn't pick them up again. They just wouldn't reset. A hotfix was applied in hopes to fix this issue, and it seems to have only partially done the trick. Instead of resetting them all, only a few dailies are repeatable. And it's random each day. There are rumors that each continent will only offer one Tamer daily per day, and it's random. I find this hard to believe since I just completed two dailies for EK today, and four yesterday night. But if each continent is really supposed to only have one daily, then multiple NPCs offering the daily is a bug. If the latter isn't the case though, then dailies are still not being reset properly. The Grand Master of EK hasn't had a daily quest available for two days straight, while the others seem to have one on and off. I mentioned that I was able to complete four yesterday, but only two today. Another possibility is that a random number of dailies (but not all of them) will be available each day. Again, this is hard for me to swallow because that would mean players would need to travel to each NPC every day just to find which ones are offering the quest. I mean, I know Blizzard wants to make stuff challenging and all, but I can't see them making it THAT inconvenient. So right now things are pretty up in the air. Are dailies supposed to be available from every Tamer (like they were originally presented)? Only a random few? Only one per continent? I'm pretty eager to find out the answer. TheChamberlain from WarcraftPets found a workaround for the bug that prevents newly created characters from learning the race-specific pet (if the account already has Pet Battles trained). The trick is to not log out until you've reached a trainer to buy the pet. Apparently if you log out before then and then log back in, the game will not recognize that your new toon already knows the Pet Battle ability. If you don't log out at all, there's no reason for the NPC to not sell you the race-specific pet! You'll still need to get to at least level 5 and have enough money to purchase the pet from the trainer. For Goblin, Worgen and Pandaren, that means finishing the starting zones completely before making your way to a major city. Anyway, good luck to everyone seeking the race-specific pets. Hopefully there will be an official fix for this, but until then, this workaround seems to do the trick. On a side note, I've finally finished collecting all the new crafted pets! Thank you to another guildmate of mine who crafted the Jade Owl for me. It was the last one I needed! I also managed to reach 400 unique pets, and finally received Venus. :D Such an awesome looking pet, but I kinda wish it had a unique animation. Eating a flying bug would be appropriate lol? Venus behaves much like the Ammen Vale Lashling, and will burrow into the ground when idle. Only its gaping mouth remains above ground. It looks a bit creepy with all those teeth poking out haha. Lead content designer, Cory Stockton aka Mumper, recently tweeted that the cost to train Pet Battles has been reduced. "Just hotfixed the cost of Battle Pet Training to 10g. We still don't want newbie players but 100g was obviously overshooting that goal." He also mentioned Pet Battles achievements. "Another note on pet battles, Taming Azeroth achievement is setup to complete with either Taming Kalimdor or Taming EK, you don't need both. Note that the display is wrong in 5.0.5 since the change was made via hotfix. Functionally, it will work though. UI is fixed in 5.1.0." This last bit of information is good news since completing both EK and Kalimdor can be tricky. Completing the EK achieve is easier for alliance while the Kalimdor one is easier for horde. It's not impossible, but it's somewhat of a hassle, especially if you don't have any alts on the other side. "We found the bug with pet battle daily's not unlocking. It's been hotfixed and they should work now, cross faction. Thanks for the reports!" Tonight I spent quite a bit of gold power leveling my paladin's engineering to a high enough skill level to craft the Mechanical Pandaren Dragonling. I had to farm the Spirits of Harmony since they're soulbound, though. It was quite the challenge since my pally is still 85 lol. All in all, totally worth it! I find its skin a little strange looking, though. Especially on its nose area. The dark area makes it look odd and I just can't get used to it. On top of the dragonling, a guildmate of mine crafted the Sapphire Cub for me! :D Many hugs and thanks. I've already made myself both inscription kites, so now I just need to get the other JC crafted companion, the Jade Owl, and I'll be done with all of the new craftable pets. Crossing my fingers that I come across one soon! I've been pretty engrossed in Pet Battles these days. So much so that I've neglected gearing up properly for raiding (which starts next week for my guild, meep). There were some hotfixes recently, but I don't think I'll go over them. Most of them were changes to pet abilities/attacks and bug fixes. 6 wild pets that were removed from the Pet Journal just before MoP was released were re-introduced into the journal. I'm not sure if the others that were omitted from the journal during the beta will make it back into our collections. We'll see. WowInsider has two articles that are wroth the quick read, "How to get a Hopling pet" and "How to choose between the same pets, but different stats". Other than that, it's back to hunting for pets!